If your child has been diagnosed with epilepsy or has had seizures but doesn’t have a diagnosis yet, then we are here for you. Our Parent’s Handbook tells you everything you need to know about epilepsy, its treatment and taking care of a child with epilepsy. We also produce seizure diaries for children and young people. 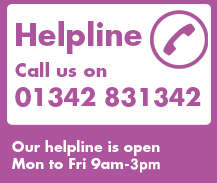 Our helpline team are here to listen and support you too. We can’t offer medical advice but the team can provide approved information on a range of issues that parents often want to know, including seizure monitors, benefits and much more. Young Epilepsy's free App helps you keep accurate records of seizures and medications.